Sr. Cecilia Espenilla, OP is a member of the Congregation of the Dominican Sisters of St. Catherine of Siena, which was founded in the Philippines in 1696. After college she worked at the First United Bank in Manila but seven months later she resigned and responded to the call of God to enter the religious life in 1975. Since then she was assigned in various roles and responsibilities as Religion and Values Education teacher, School Treasurer, Principal and President of the College. She was also elected as the Superintendent of their 27 schools in the Philippines for a term of 6 years and as member of the General Council, the highest decision making body of the Congregation, for a term of 12 years. At present she is the Coordinator of the Justice, Peace and Integrity of Creation (JPIC) of the Congregation. 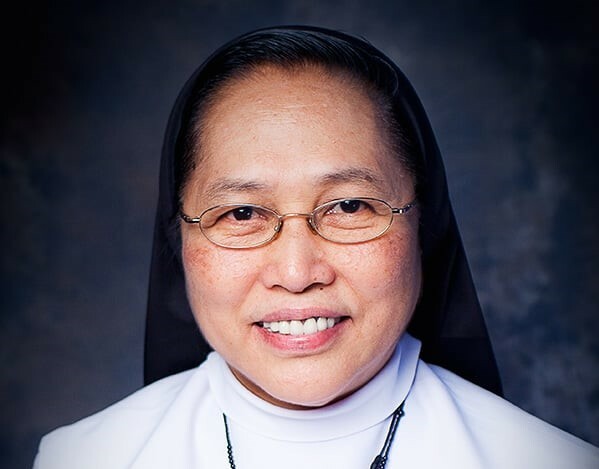 While doing her major responsibilities in the Congregation she was elected in Rome as the Dominican Sisters International (DSI) Coordinator for Asia-Pacific and as such she was also a member of the DSI International Coordinating Council for a term of six years. The Council meets in Rome every year. DSI is an international movement of 123 Dominican Congregations in the world. As Coordinator she visited the Sisters’ communities and their mission and gave a talk about the Dominican Life and Mission and the DSI Movement during her visits in Vietnam, Taiwan, Indonesia, Thailand, South Korea, Japan, Sri Lanka, India, Pakistan, Lebanon, Jordan, Israel, Australia, New Zealand and Solomon Islands. At present she is the DSI Asia-Pacific Promoter of Justice, Peace and Care of Creation (JPCC) and a member of the International Dominican Commission on Justice and Peace (IDCJP). In 2013 and 2014 she attended the sessions of the Commission on the Status of Women (CSW57 and CSW58) at the United Nations Headquarters in New York representing DSI Asia-Pacific. At present she is the Coordinator of Talitha Kum Philippines a worldwide network of religious congregations with a base in Rome called Talitha Kum. This is a project of the International Union of General Superiors (UISG). As an anti-human trafficking advocate she has provided massive awareness, information and education campaign to various sectors in the Philippines reaching out to an estimated 125,000 mostly students, out-of-school youth, poor communities, Parishes and Dioceses, Barangays (the smallest government unit) etc. over the last four years and providing training to religious brothers and sisters and lay partners to become anti- human trafficking advocates. Having held various roles and responsibilities inside and outside the congregation she feels that so far her justice and peace ministry especially with the work against human trafficking is the most challenging, difficult, dangerous but fulfilling. Her worked has touched people not only the poor and the victims but decision makers as well. She has to talk to them and convince them to respond to the cry of the poor, especially those whose dignity and freedom have been violated and ignored. Sr. Cecilia was born in the Philippines into a family of eight children, 5 brothers and 2 sisters and the seventh in line. Her parents who are now in eternal peace were respected in their community, her father was a government official and her mother was a school teacher. All her siblings are professionals and are married except for an elder brother who is a Diocesan Priest and an elder sister who decided to stay single. She graduated in college with a Bachelor’s Degree in Commerce, Major in Accountancy at the University of Sto. Tomas. As a religious she pursued graduate studies and has earned a Master’s Degree in Theological Studies at the Ateneo University and a Phd candidate in Educational Management and Leadership at the De La Salle University.